A decade ago there was a little web app that allowed patrons of the Provincial Library Service to submit an interlibrary loan request form online. It wasn’t particularly user-friendly, but it was there. And it allowed patrons like me to build tools like this ISBN-to-Interlibrary-Loan bookmarklet. It’s now 10 years later, and the Provincial Library Service has regressed: patrons visiting the Interlibrary Loan page are instructed to “Fill out and submit an Interlibrary Loan Request Form to your local library.” And by “submit” they mean “put your coat and boots on and walk over to the library and hand it to them in person.” The library helpfully Tweeted that forms can be emailed. As if this regression weren’t bad enough, the form itself isn’t even a bona fide PDF form, so you actually have to print it out and fill it out by hand. In other words, we’ve successfully recreated the 1973 experience of making interlibrary loans. 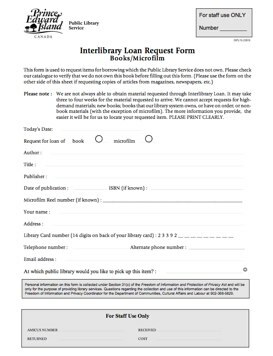 At the very least the process calls for an improved PDF form – it calls for much more, but you have to start somewhere – so in the spirit of co-creation, I’ve created the Interlibrary Loan Request Form 2.0. It’s the same old form, but with PDF-form-filling-magic applied to it, so it’s slightly less hostile. You still need to, in theory, walk it over to the library – although you could try emailing the filled-in form and see what happens – but at least it need no longer be filled out with quill pen by candlelight. Written December 11, 2013 at 10:18 a.m. In all fairness to the PEI library system, this Interlibrary Loan Request Form is actually an Interlibrary System Loan Request Form, not to be confused with the ease of requesting an in-system item from another library on PEI. Our family makes heavy use of the ‘request an item from anywhere on PEI’ service to bring materials to our local library. Given the restrictions that most library services have in other regions (usually bounded by city or county systems), the ability to request an item from any library on the Island makes for a rather staggering number of items at our fingertips. Plus, going to the library gives you a chance to talk with our outstanding librarians who have been curating cross-media content long before it become the past-time of internet denizens everywhere.